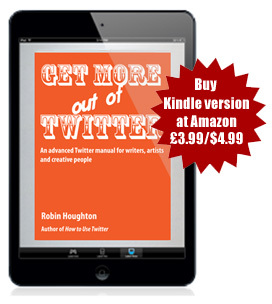 February 2017 – Get More Out of Twitter – An Advanced Manual for Writers, Artists and all Creative People by Robin Houghton is the second ebook in a series aimed at making social media simple. Robin Houghton really knows her stuff. I highly recommend her books to writers who want to learn to use social media. Available in both Kindle ebook versions and PDF download. What more could you be doing to make it work for you? Twitter ‘early adopter’ Robin Houghton takes you on a step-by-step journey, with screenshots and insider tips. Learn how to choose and use a social media dashboard, empower yourself with stats, find people and conversations that matter to you and save time and energy with shortcuts, advanced search and good housekeeping. Get More Out Of Twitter is the follow-up to How to Use Twitter – it contains all NEW information and digs deeper into Twitter for those who have mastered the basics. 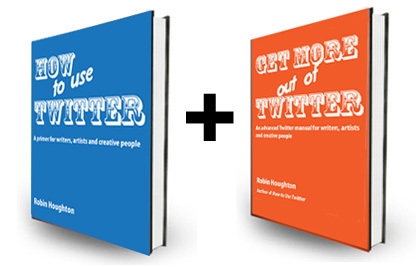 Both books are perfect for all creative people who want to get MORE out of Twitter without it eating into their creative time. Writers are frequently frustrated by Twitter’s steep learning curve or feel they’re not effectively using the platform. Robin Houghton’s primer of actionable tips with easy-to-follow illustrations shows how best to use this powerful networking tool. I’M A WRITER. WHY SHOULD I BE USING TWITTER? We constantly hear how publishers and agents expect authors to be active on social media channels, reaching out to their readers and potential readers and marketing themselves via a blog, or on Facebook, Pinterest and Twitter. Journalists frequently rely on Twitter as a search engine when they are sourcing experts and ideas for articles. For many of us, the idea of MARKETING oneself is not appealing. The good news is that if you are using Twitter effectively, the way you will learn in this book, you won’t feel like you’re doing any marketing at all. What you WILL be doing is discovering and having conversations with people who want to read or publish your work, people who can help you with research, with getting published, with promotion, people who are interesting, engaged and on your wavelength. Robin Houghton is that rare thing, an expert who can communicate her expertise! I’M NOT A WRITER. IS THIS EBOOK ANY USE TO ME? Absolutely. The book is aimed at anyone who would (honestly) rather be creating. The knowledge in Get More out of Twitter is invaluable to anyone wanting to make the most of the platform without wasting precious time on it. I’M NEW TO TWITTER. WILL THIS EBOOK BE RIGHT FOR ME? If you’ve never used Twitter before, or started and stopped without getting the hang of it, then I recommend you start with my first ebook, How to Use Twitter, which takes you through all the essentials of setting up your Profile, navigating your way around Twitter, creating your network, getting organised and understanding the terminology and etiquette. Buy the PDF version here or the Kindle version on Amazon. Your Twitter advice was the best I’ve had! I’VE SEEN OTHER TWITTER GUIDES THAT ARE FREE – WHAT MAKES THIS EBOOK SPECIAL ENOUGH TO PAY FOR? It’s true there are plenty of Twitter guides around, but those that are free are generally either being sold by a company with a vested interest in getting people onto Twitter, such as social media marketing organisations or software houses, or by individuals selling training courses or their own social media marketing expertise. There’s no hidden agenda here! Just excellent quality, step-by-step instructions backed up by actual screen shots. No fluff, hype or library images. Free guides can be light on detail and a bit ‘padded out’, whereas How to Use Twitter and Get More Out of Twitter are nothing but the lean meat. With content written in Robin Houghton’s signature ‘friendly textbook’ style, precise screenshots, detailed explanations and Insider Tips, everything in this book is useful and relevant. You can trawl the web for some of this information but without knowing the questions to ask it’s hard to get to the answers. All the advice here has been tried and tested by Robin herself over her ten years on Twitter. It’s like having private tuition from an expert, but at a tiny fraction of the price! WHY SHOULD I TRUST THIS AUTHOR’S ADVICE? Put simply, she’s walking the talk – and has been making a living from online communications for seventeen years. She has worked in online marketing ever since, and, after joining Twitter in 2007, has specialised in social media marketing and communications. Robin delivers every time in a clear and simple way that gives her reader the right level of information in an interesting way. Robin’s abiding belief is that the internet is about PEOPLE not technology. There is NOTHING holding us back from mastering social platforms, nothing that is but ourselves. Robin’s ebooks are just like her mentoring sessions – all about instilling confidence in people and the realisation that everyone has it in them to not only DO this stuff, but ENJOY it too! Robin has worked with small businesses, large organisations and individuals and is an experienced trainer and speaker. Clients have ranged from London Metropolitan University and the John Lewis Partnership to many individual authors. Not only this, but Robin is a blogger, a published poet and a business writer. She authored the best-selling Blogging for Creatives (2012), Blogging for Writers (2015) and The Golden Rules of Blogging (And When to Break Them) (2015). All three are published by Ilex Press in the UK (an imprint of Octopus, part of Hachette Media) and by HOW Books in the US (Writers Digest). The books have sold internationally and been translated into Spanish, Italian and German. 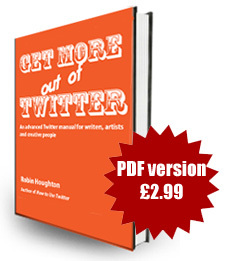 Get More Out of Twitter is available for both Kindle and PDF. The Kindle version can be read on other devices using the free Kindle Reader. Buy Get More Out of Twitter now on Amazon….